Goldsmiths Sale is now on across all diamonds. They would make the perfect christmas presents! With showrooms all over the UK, Goldsmiths has come a long way since opening their first store in Newcastle in 1778. Yes, that's how long they've been selling jewellery and watches to thousands of satisfied customers. Goldsmiths are stockists of leading brands of watches such as Cartier, Omega, Rolex and Gucci as well as other prestigious names. In fact, Goldsmiths were the first jeweller in the UK to be appointed stockists of Rolex watches. 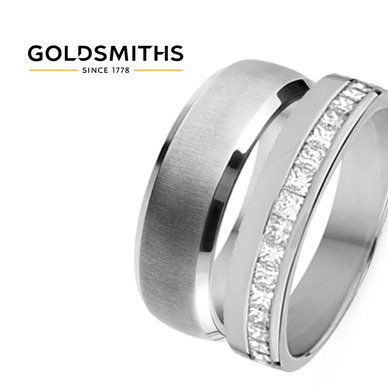 Goldsmiths are synonymous with quality and their selection of jewellery - for men and women - includes engagement and wedding rings, necklaces, bracelets, earrings and cufflinks. Other brands at Goldsmiths are TAG Heuer, Breitling and Canadian Ice. Add Goldsmiths to your Favourites list and be the first to know every time they have a Sale on! 1st January 2018 - Goldsmiths New Years Day sales for 2018. 7th May 2018 - Goldsmiths Early May Bank Holiday sales for 2018, add to your diary now! July 2018 - Goldsmiths Summer 2018 sales, joining us? 23rd November 2018 - Goldsmiths Black Friday sales in 2018 start on Friday 24th November. Add products from Goldsmiths to your Love Sales list. Get the Love Sales button now! Goldsmiths January Sale is now on across all diamonds. They would make the perfect christmas presents! Goldsmiths Boxing day Sale is now on across all diamonds. They would make the perfect christmas presents! Goldsmiths Christmas Sale is now on across all diamonds. They would make the perfect christmas presents! Goldsmiths Cyber Monday Event is now on across all diamonds. They would make the perfect christmas presents! Goldsmiths Black Friday Event is now on across all diamonds. They would make the perfect christmas presents!